I must confess that Steve Orlando's short run (which ends this issue) on this title has been less terrible than I'd expected. While a number of problems that are pronounced enough in the writer's work to earn the adjective 'Orlando-esque' have persisted, there has nevertheless been a thematic coherency to the five issues that has been very welcome – namely a clear focus on Wonder Woman's compassion and peace-making, on her dignity and moral strength. This continues with the current issue which, while by no means perfect, manages to leave this reader at least with a rather pleasant feeling of satisfaction. Don't you just hate covers that give away significant aspects of the story inside? Particularly when the scene they're portraying isn't even in the book? 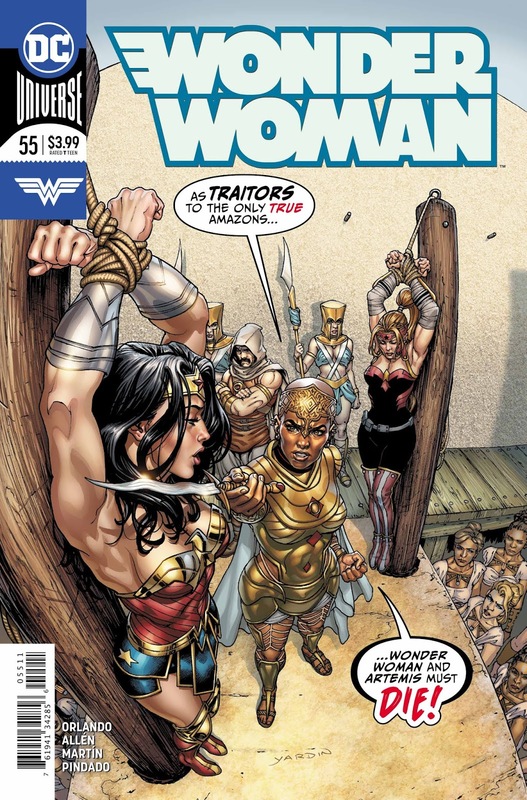 Well, that's pretty much what happens with this issue's cover, which depicts Queen Faruka II about to execute both Wonder Woman and Artemis as traitors to Bana-Mighdall. Firstly, that doesn't happen in the story. Secondly, it rather neatly undercuts the first half of the book which is at least partly concerned with the friction between Diana and her Amazonian sister. This friction is eased simply by Diana using her magic lasso on Artemis, binding her hands and taking her inside 'the golden perfect'. I'm not sure how I feel about this. 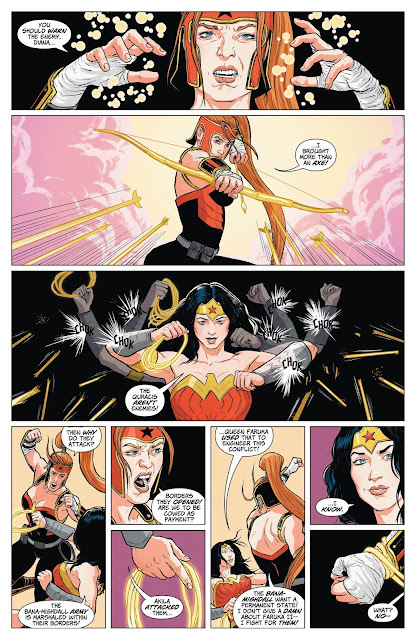 On the one hand, it's actually a pretty dramatic device, giving Diana an opportunity to speak to Artemis honestly about her motivation for fighting the Quracis in a black void that Diana says is Artemis' soul with no distractions around them. On the other, it does raise a number of questions. Is this what it's always like being bound by Diana's lasso? Why the blackness? I get that it's dramatic and forms a contrast with the illuminating 'light' of the perfect, but it still feels a little odd. Then, there's the issue of what on earth is going on 'outside' the perfect. They are, after all, in the middle of a battle. Does the perfect stop time, too? Are they just standing still while the battle rages around them? Isn't that a bit… impractical? The panel progression when Diana (inevitably, given the cover) persuades Artemis that fighting the Quracis is not in her people's best interests is unclear, too. Again, there's drama implicit in this moment, but it's there at the expense of clear storytelling. And fighting, surely, doesn't end that quickly and simply. Then there's Rustam. And one of the more controversial moments in this issue. While the Quraci military whom Rustam is nominally supporting (appear to) surrender, Rustam, undeterred, decides to attack both Wonder Woman and Artemis directly. This seems a touch bold to me, but then again maybe not. 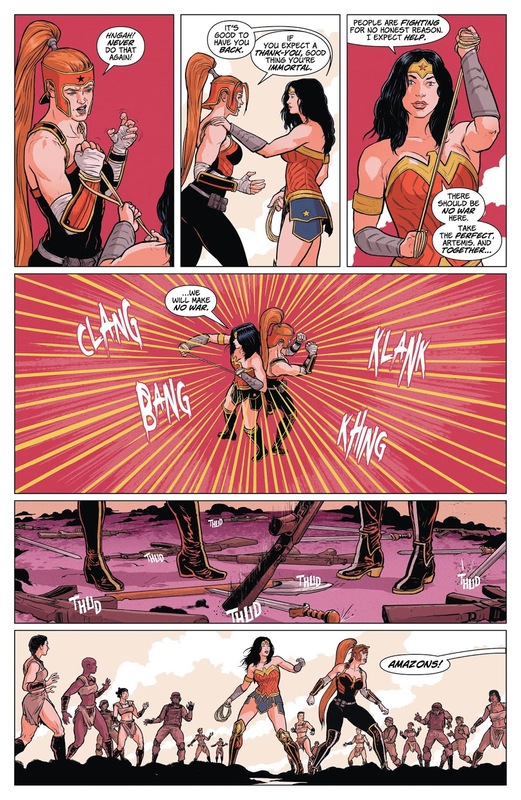 In a move that harks back to the climax of issue 53, Diana and Artemis attempt to fire the Bow of Ra together only for Rustam's plasma blades to shear first the just-loosed arrow and then the bow itself in two. Artemis' reaction of stunned disbelief is perfectly understandable. Given that the Bow of Ra was the focus for a major story arc in Red Hood and the Outlaws where its status as a near-apocalyptic superweapon was established, I kind of know how she feels. It's up to Diana to supply a more Diana-esque solution to the Rustam problem. Yep, it's time to whip out that lasso once again. There's a real surprise at the end, though, when, having seen the Bow of Ra destroyed by Rustam, we now get to see Superwoman's lasso of submission given to Artemis to tame and, ultimately, redeem. The character progression of Artemis is shown symbolically here with this change of weapon, I suppose. The problem, as it always is with DC at the moment, is figuring out to what extent this will actually matter going forward. We shall have to see. I can only imagine, though, that most fans of the character would rather see this kind of character-changing development take place in her 'main' book rather than in a guest slot in this one. I don't know. Artemis and Diana's relationship has been the main focus of the last four issues. While Orlando's characterization of the level-headed, courageous and warm Diana is generally very good, his Artemis has had to do things in service of the plot that makes her characterization more problematic. Last issue's response to Faruka's shooting of Atalanta remains the big problem. 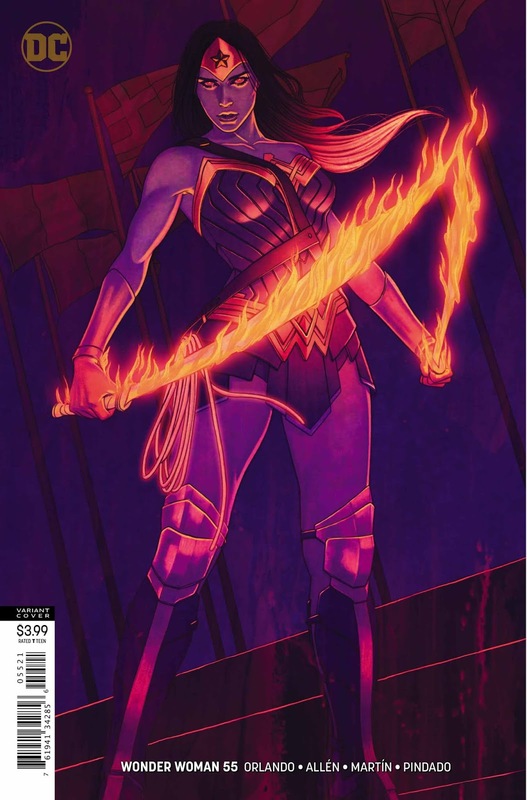 Not only does it make her brief transition to Wonder Woman foe quite jarring, but it renders this issue's outrage against Faruka less convincing too. Which is a bit of a shame, because this story is actually quite interesting. Throwing Artemis, Diana, Atalanta into a confrontation with Rustam and Faruka with the fate of the entire 'lost' Amazon tribe of Bana-Mighdall hanging in the balance is an intriguing premise for the story and, to be fair, what we get does explore some of those relationships rather well. What it doesn't do, though, is show us the implications of important aspects of that premise well enough. While we see the Quraci army, we do not see the government that dispatched them or, for that matter, get much of their perspective apart from a couple of snatches of dialogue in issue 54. Orlando's handling of Rustam and Artemis gives us glimpses of sympathetic, well-rounded characters but those moments are inevitably obscured by dialogue that too often descends into crude posturing. The destruction of the Bow of Ra feels like it should be a bigger moment (it was, after all, responsible for defeating a god in issue 53); the appearance of Superwoman's lasso from out of nowhere, although thematically 'right' for the story, feels distinctly odd and out of place. These issues mean that the comic, although perfectly readable and, to a large extent, enjoyable enough, still feels like a bit of a let-down. Although Allen and Martin's art continues to impress and Orlando's characterization of the title character remains warm and compassionate, the story as a whole relies a little too much on a plot device so good it had to be used twice and an awful lot of earnest conversation. Of the main characters, Artemis is perhaps the one whose portrayal suffers the most because of the demands of the plot. Orlando's grasp of political realities is reasonably assured at the end, but that end is consequently somewhat anti-climactic.. As a result, this issue is very much a mixed bag. 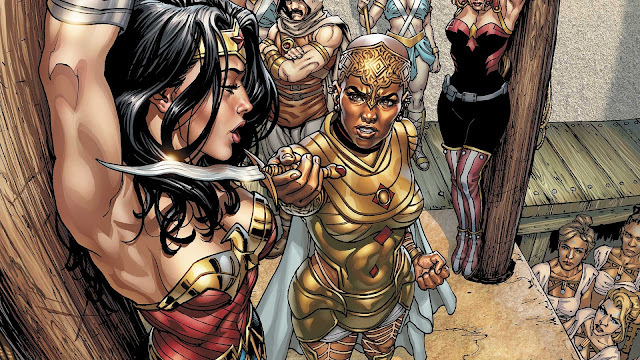 This issue of wonder woman fills me with the utmost hate for Orlandos Story telling. This was supposed to be a team up arc for Diana, but instead we got the putting down of another character to prop up another. And in my opinion that is one of the worst comic troups a writer can commit. Rustum not only defeats Artemis so easily but actually destroys something that was the soul purpose for Artemis arc and reason for being part of Rebirth & The Outlaws. The Bow of Ra is Proof that Artemis is The Shim-Tar Champion of Bana Migdall. Basically she is the Wonder Woman of her people. Destroying the Bow is like destroying Dianas Lasso of Truth. A wonder woman without a lasso doesnt sound like a wonder woman to me how about you? Besides in what world is Rustum contending with The Bow of the Freaking SUN with his swords that are made of FLAMES. The hoekey ending with people releasing theyve done bad things so they should stop is what I call a trash ending to a trash villian. The only thing this book has good is art.